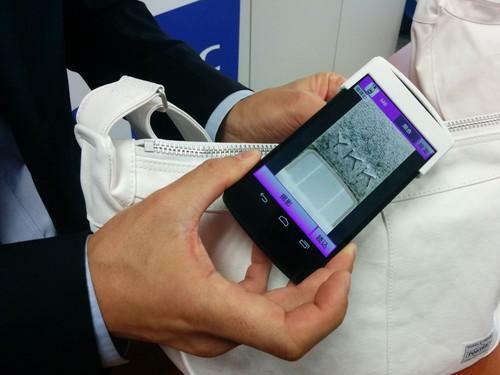 An NEC staffer demonstrates an anti-counterfeiting smartphone app on Monday in Tokyo. The "object fingerprint" technology can compare smartphone photos of minute manufacturing patterns in metal and plastic objects and compare them with a database to establish their origins and authenticity. The electronics maker has developed an authentication system that compares images snapped with a phone with those in a cloud-based database. Images of the authentic product from the manufacturer would need to be registered beforehand. The "object fingerprint authentication technology" is the first such system in the world that can identify individual objects, according to the company. The know-how makes use of fine patterns in the grain of metal or plastic that occur naturally during manufacturing and are invisible to the human eye. The system can be used to find pirated goods, to trace the origin and distribution through the marketplace of authentic goods and to manage components in industrial applications such as maintenance and repair work, making sure they're being used correctly. The technology, which can also work with tablet cameras, allows for objects to be identified at low cost and without special processing, according to NEC. The accuracy of the system depends on the material in question, but NEC said its tests on bolts yielded an equal error rate (EER) of less than one in 1 million. The EER is an accuracy measurement used in biometrics in which lower figures suggest more accurate devices. At a demonstration in Tokyo on Monday, NEC staffers fitted 3D-printed close-up lens attachments, developed by NEC, to standard smartphone cameras. Then they photographed objects, such as the zipper pull tab on a luxury handbag and the head of a screw, in extreme close-up. By querying a cloud database of images and related information through an NEC smartphone app, the system ran a pattern-matching check and quickly identified the parts to confirm their authenticity. "This is a continuation of NEC's work on fingerprint recognition," said Toshihiko Hiroaki, a senior manager at NEC Central Research Laboratories. "The growth of the biometrics market had stalled, so we were looking for a new business opportunity." While standard macro lens attachments for smartphones could work, NEC said its own attachment was most effective. It plans to commercialize the component, but would not say how much it could cost. NEC said it is looking for partners to commercialize the object fingerprint technology in its 2015 fiscal year, which runs to March 31, 2016. The company's fingerprint matching technology recently took the top spot in a test by the U.S. National Institute of Standards and Technology (NIST). Earlier this year, the company showed off a biometric security program that uses face recognition to unlock access to PCs.